A star-studded ceremony recognising the sporting endeavours and achievements of groups and individuals from across Bucks took place at Aylesbury’s Waterside Theatre on Friday December 1. Organised by LEAP, the event saw ten accolades handed out to those who inspire and promote sport in a positive way across the county. The Bucks sports awards - keynote speakers Greg Rutherford top left and Derek Redmond bottom right. Award winners St Michael's School top right and Bucks College Group bottom left. Nominees and invited guests were also treated to inspirational speeches from British athletes past and present as Derek Redmond and Greg Rutherford spoke about their careers running and long jumping respectively. Individuals and groups from across Aylesbury Vale scooped four awards on the night. The first Aylesbury-based winners were Bucks College Group, an amalgamation of Aylesbury and Amersham & Wycombe College, who took home the Active Workplace of the Year award. Sports Development Officer Taofeek Oyeyemi said: “It is an amazing feeling to win this award. The Primary School of the Year award went to St Michael’s in Stewkley. Headteacher Della Peacock said: “We’re absolutely delighted - it’s fantastic news. The Young Leader award went to Aylesbury Grammar School pupil Adam Woodage who is also a football and handball coach. He said: “It is really rewarding and humbling to be recognised for the hard work that I do. The Volunteer of the Year award went to Georgie Camfield, chair of Wingrave Netball Club. 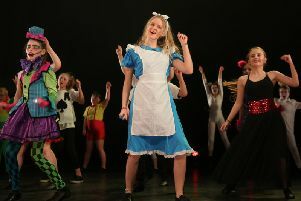 The evening also featured pre-awards entertainment from the cheerleading team at Lord Grey School in Bletchley and post-award entertainment from Aylesbury Grammar School’s jazz band, who were joined by some soloists from Aylesbury High School.